Despite the warmer temps in Chicago this week, the chill in the air has brought out one of the most widely used products we see every winter in the Midwest: the BundleMe from JJ Cole Collections. They’re everywhere. After seeing them inside so many car seats today at the BCBrunch, I decided I wanted to update a previous post on this product. Don’t get me wrong, I LOVE the BundleMe, I really do (we featured it last year on our Gift Guide reveal on “Windy City Live.”), but I write this post as an update to the one I posted when Toddler J was a baby, as it is very important to make sure that you are using this product (or any other buntings) the right way. So you may be asking yourself, “why did I buy this product.” And I am happy to tell you. The BundleMe (or any other bunting) is the perfect accessory for any stroller during a cold winter or even a brisk fall day. Blankets fall off, getting snowy and wet. A bunting keeps your baby/toddler warm and cozy against the elements of your typical Chicago winter. We put ours on our stroller once it gets really cold outside, and it doesn’t come off until spring. We love it and I don’t know what I would do without ours. The JJ Cole Car Seat Cover. We used this product during our entire first winter with J. It is simple and easy, and is meant for the car seat, specifically the infant car seat. If it was REALLY cold, or we were going for a walk with the car seat on the stroller base, we would stick a blanket inside. 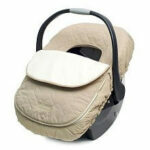 It goes AROUND the infant car seat, so it does not interfere with the straps or the performance of the actual seat. Unzip the top of the JJ Cole Bundle Me and use it like a blanket, draping it over your baby and tucking it in on the sides. This is a solution that doesn’t require purchasing a second product. Just know, that once your baby starts to move around and kick, it sometimes will slip and fall off. Simply use a blanket. It’s an easy, age-old way to stay warm, and surely you got many cute ones for gifts when your baby was born. I was completely guilty of using my BundleMe in the wrong way when J was a baby. 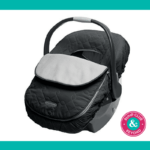 I also remember that when I had the BundleMe inside the car seat it was hard to find the straps, tighten the straps, and they were always getting tangled. When Toddler J was only six weeks old, I met with our Resident Safety Expert, Brooks Watson of the Safety Squad, and he set the record straight for me. He explained all of this and more on how to keep J safe both in the car seat and out. He showed me how she should be strapped in, where the seat should be in the car, and how to install it correctly. He told me how to keep her warm all winter long. His goal is to keep our babies safe, no matter what. My goal is to simply pass on his advice and knowledge and aid in doing so when appropriate. Hopefully this helps to set the record straight about one of our favorite products as we move into the holidays and winter months. Expectant Parents: You can see our Resident Safety Expert, Brooks Watson, at our Expectant Couples Dinner: Baby Gear Safety, on December 11, 2012 at Little Beans Cafe. This always popular talk will focus on how to use your gear correctly, with a large focus on the car seat, installing it properly and more. More information can be found here.